Full Title Johnson's County, Township And Sectional Kansas And Nebraska From The Latest & Best Information. Revised & Corrected by R. Quinn, Survr. Gens. Offe. Publisher Published By Johnson & Browning, 172 William St. N.Y.
Copywrite Entered ... 1858, by A.J. Johnson ... New York. 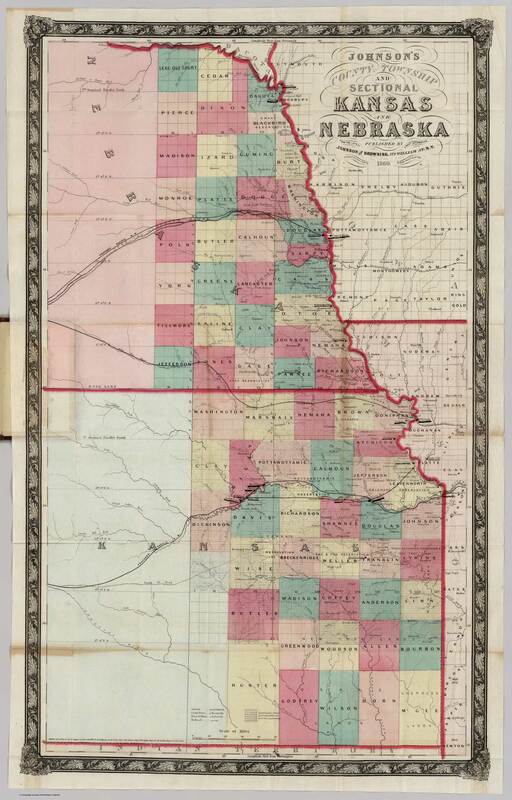 Notes This map is most likely a Colton map published by Johnson and Browning as the cover title is "Colton's Sectional Map of Kansas and Nebraska, Johnson and Browning" and it was first issued by Colton in 1858.